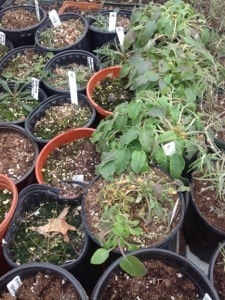 Winter field trip to a native plant nursery. 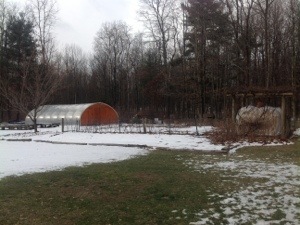 This week I had the distinct pleasure of taking a winter field trip to a native plant nursery in Valley Falls, NY. This is a female owned and operated business, which makes it that much more fun to support. I was delighted to be given a private tour of the property. 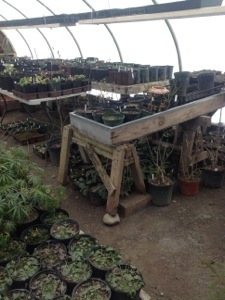 Wildthings Rescue Nursery specializes in Trillium and other woodland plants. The deer have been especially incorrigible in browsing the Trillium this year, the proprietor recently (and creatively) erected this metal fence project for protecting the Trillium. Ecological gardening and improvization are sister skillsets. Seeing the sleeping beauties that are our region’s fine native plants spoke to me at the most visceral level. Given that we have a physical connection via the food web to these lovely organisms, it seems prudent to reflect on any wisdom or life suggestions they may throw off at any time of year I interface with them. 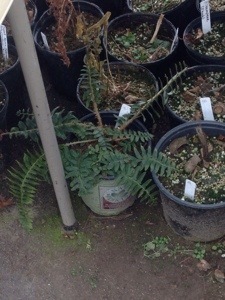 In the New England winter garden scene, even the most ebullient native plants are dormant and sleepy. They cease photosynthesis action and quietly, peacefully wait for the days to get longer. I don’t sense they mind the downtime. 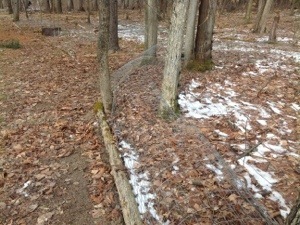 This encourages me to emulate their seamless transition through the seasons, and not fight nature. Weather and other natural systems do what they have to. I count myself lucky to be along for the ride. 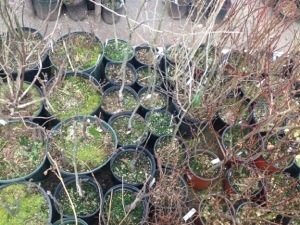 Imagine how much life saving and life creating habitat will be developed in gardens after these young native shrubs are relocated. Butterflies, birds, small and large mammals: rejoice. 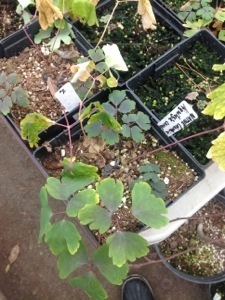 Wild Columbine (Aquilegia canadensis), future producer of copious nectar for hummingbirds and butterflies. 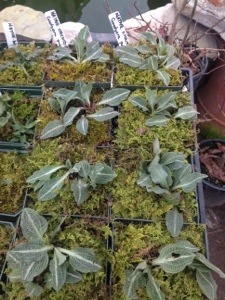 Wild orchids (Goodyera pubescens) for the woodland garden will have yellow flowers. 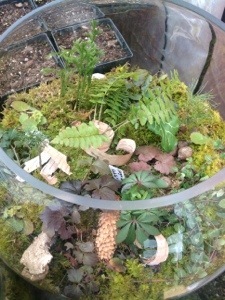 Woodland terrariums are a lovely way to connect with nature, even in a winter gardening context. 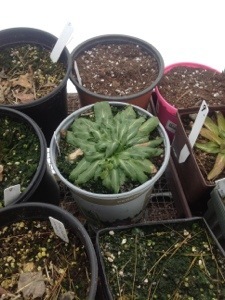 Another way is to take a winter field trip to a native plant nursery, an activity I heartily endorse, particularly if one is pining for warmer weather and the outdoors. Seeing how the wildflowers peacefully endure a harsh climate encourages me to mimic them by borderline hibernating if my schedule permits seasonal cloistering.